To Predict Nobel Winners, Skip Vegas And Check The Fine Print : Shots - Health News A careful analysis of the number of times research is cited in subsequent scientific papers can shed light on who is most likely to pick up a Nobel Prize. 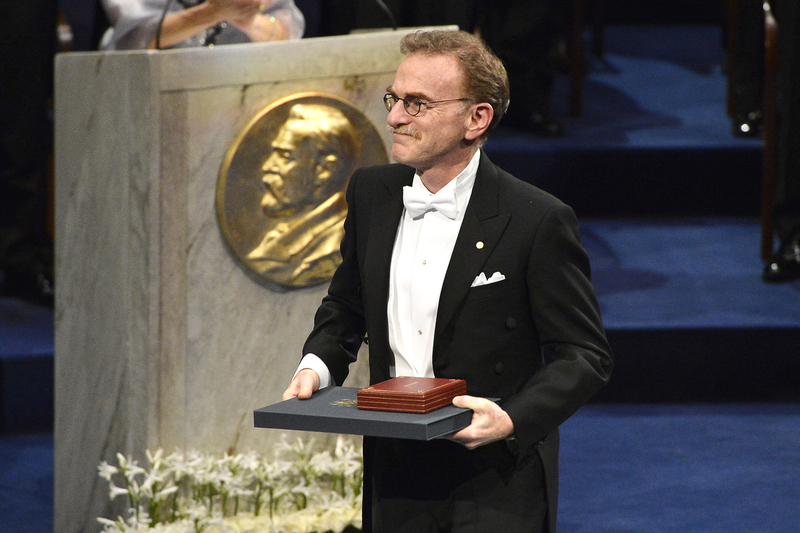 Molecular biologist Randy Sheckman, who shared the 2013 Nobel Prize in physiology or medicine, acknowledges applause after receiving his prize during the ceremony in Stockholm last December. Some people like to bet on horses. Others wager on football games. And while there may not be any money in picking the next Nobel Prize winner, that's no reason not to have a little fun trying. On Monday Oct. 6, a scientist or two, or maybe even three, will get called from Sweden with good news about the Nobel Prize for physiology or medicine. Who will it be? Some folks at Thomson Reuters have some ideas. They've essentially pored over the footnotes in scientific papers to figure out whose work has been referenced the most often in influential journals. The analysis was a little bit more complicated than that. They crunched the numbers in databases of citations to figure out how many times possible winners got their papers cited. They also compared that number with how many times average scientists in the field got their papers cited. The analysts, working in Thomson Reuters' intellectual property and science unit, went beyond these numbers: They handicapped the work subjectively. They gave credit to research that overturned dogma or has already made a big difference in science or medicine. As you would expect, the Nobel committee often likes that type of research. The analysts also considered whether a Nobel has been awarded in the last couple of years for work in the same general area. If so, it's likely the prize committee would wait a while to recognize even worthy research. Who are the scientists to watch? A drum roll, please, for this year's Citation Laureates, as Thomson Reuters calls them, for physiology or medicine. Consider it the research Daily Racing Form. "These are real giants of molecular biology," says David Pendlebury, an analyst with Thomson Reuters. They helped unravel details about how and when cells turn on genes. That is, how cells know when to synthesize RNA using the DNA, so it can make proteins. "You scratch your head: Why didn't these guys win already?" Pendelbury tells Shots. The work, begun in the 1990s, used capsaicin, the chemical that makes peppers hot. "It's fundamental science," Pendlebury says, but researchers in academia and industry are already making use of the insights to come up with potential new therapies for pain, anxiety and depression. Charles Lee, Jackson Laboratory for Genomic Medicine, Farmington, Conn.
Michael H. Wigler, Cold Spring Harbor Laboratory, Cold Spring Harbor, N.Y.
Each of us has about 20,000 genes on our chromosomes. But large stretches of our genome can get duplicated or even copied several times. The specific number of copies, at each location, can vary quite a bit from person to person. "Most of the time [this variation] has no effect," Pendlebury says. But Scherer and Wigler have been exploring the association between these genetic duplications and some diseases, such as autism, schizophrenia and even cancer. The work has helped overturn dogma that held individual genetic variation was relatively small. Since Thomson Reuters began naming Citation Laureates in 2002, 35 of the 211, or 17 percent, have gone on to win Nobel Prizes. When it comes to picking the winners for any given year, it's pretty tough. Pendlebury says the yearly calls have been exactly right five times. "What we're really doing is saying that our indicators tell us that this person is of Nobel class," he says. "We would expect they'd be a strong contender." There are somewhere in the neighborhood of 200 to 300 people nominated for each Nobel, he says, so there are always more people of prize caliber than actually win. "These researchers deserve public recognition, and they don't often get it," Pendlebury says. The Citation Laureate is one way to do it.